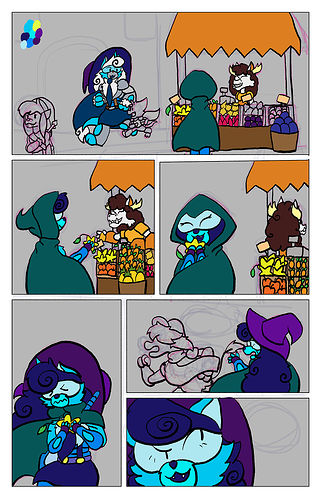 Hey everybody, I recently started working on DRGN finally and I got halfway through lining and coloring the first page (not counting the prologue) and it's not really clicking with me for some reason. I'm not sure if it's just me and my perfectionism, or something else entirely. I like some things about it (Like the lining on Selena) but I'm not sure about other stuff (like the designs of some of the background cameo characters.) Do you guys have any feedback on this WIP page and how to improve it? Or am I just letting my perfectionism get the better of me? at first glance what is bothering me the most is that grey bg color, but I can't tell if that is temporary or not. Also the bright orange canopy is drawing a lot of my focus away from everything else on the page so you may want a more muted color for that. were you thinking of adding any shadows or highlights? Thanks for the advice. Yes, I was planning on adding shadows and highlights later and the great BG is temporary. Thanks for the feedback regarding the colors. I think the saturation is a bit too much as well on some of the background elements. Any tips on how to get less bright colors in Photoshop without fiddling with layer styles? Any tips on how to get less bright colors in Photoshop without fiddling with layer styles? Manually pick a less saturated color? While I understand the page is a WIP, when talking art direction it's helpful to show what the finished style looks like! IMO don't sweat too much about background character designs. They have to look like they fit in that world, right? Without drawing focus away from the main character? That's all they need to do. They don't need to have a super amazing design. Ah ,thanks for the tip. 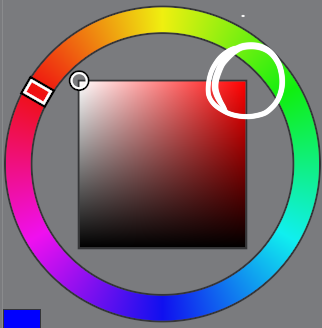 I should give the color picker a another go as well and get more used to that instead of relying on layer styles. Also, thanks about the background characters as well. I was namely a bit worried about them seeing as most of them are redesigned characters from other webcomics (@dragonsparking's Rip and @alliascompany's Autumn are the two main ones.) and I wanted to do their characters justice in their dragon versions of them. I think the best way to find a color scheme that suits the mood of the scene or the location. I'll use a comic page of mine as an example. 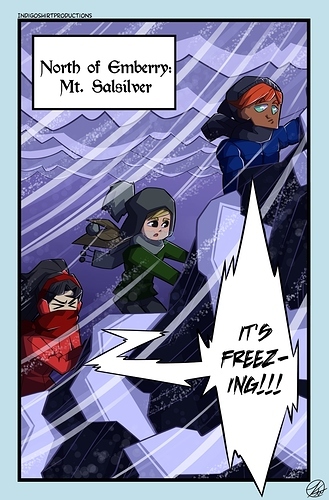 The location is a stormy mountain, so the over all colors are blues and purples, even though the characters have their own specific color scheme. The blonde character's hair is brown if you use the color picker, but looks blonde in comparison to everything else. A little more advice could come in the order in which you do things. I understand the feeling of wanting to get to the coloring and the shading right away, but it is better to finish sketching then move on to lining then move on to coloring then move on to shading and highlighting. Also, instead of cleanly coloring within the lines at first try, messily filling in colors until you get the ones that fit the mood, local, and characters works well too. Lastly, using an overlay or hard light layer of the most common or most important color over all other colored layers can really bring a scene or setting together. And @keii4ii is right, having all the colors on a character or in a scene be very saturated is hard to look at and can be distracting for the reader. But it's all a matter of preference and what works well for your story. Give your series a little time to breathe, while you make it. When I started Dragon Sparking I hated the appearance of it, but kept pushing through. It took me about 12 chapters to really settle on a feel, and about 4 more after that did I start feeling satisfied in it's look. Some things just take time. I think what you have so far looks good, and once you get those backgrounds done it will feel more complete. As for Rip in the background. I like the way he looks. But like said before, the Background characters aren't the focus. Look up some videos on digitally coloring. It might help. And yeah as beta mentioned avoid the top right corner. Generally the more downwards you go on the square, the darker. More upwards, lighter. The more right you go, the more saturated. Just careful going towards the black area otherwise you might end up with muddy colors. Thanks for the encouragement and feedback! By don't release it after you finish it do you mean redo it after you find your footing? Or release it as is after you make a few more pages? Glad you like the Rip design as well, he's fun to draw. Thanks for the advice. I never thought of messily blocking everything in first before the line art to get a feel for the pallet. I just might try that as well. I have been experimenting with Overlays recently, so I might give that a shot as well on my comic to boot. I mean just do more pages, I'd only suggest redoing a page, if something really really needs it, like a last resort kind of thing. Not only will you see progress but you will have a buffer too, so you don't get bogged down. Sorry, I wasn't clear. I meant after the lineart. So you'd have your lineart done then you can start blocking in colors. But guess you can do that after sketching too, but it all depends on what works for you. Ah, thanks for clarifying that. I think I might do that. If only so I can return to page 1 with fresher eyes. Thanks for clarifying that as well. I might do that with the linear as well as an experiment to see how it works. I've done a few revisions on my old stuff. Usually right before I release it. But I've also re-edited dialogue probably four times total, three of those times before I even released anything. It's a loooong process, but I'm glad I waited. Yeah, definitely. Thanks for the feedback and encouragement. I might do some more doodles to help fully nail the art style (maybe even make a test page as well) and see what I think. I suggest looking up on Lavander Towne's videos: She does a lot of help on coloring comics/art, same statement to the saturation, kinda need to tone it down a bit to make it more natural. good luck on your comic regardless! ^^ I think it has some potential so far tbh, I like the panelling and lineart so far, cant wait to see the result. Oh, I really dig LavenderTowne. Thanks for the video recommendations as well, I'll be sure to check them out! 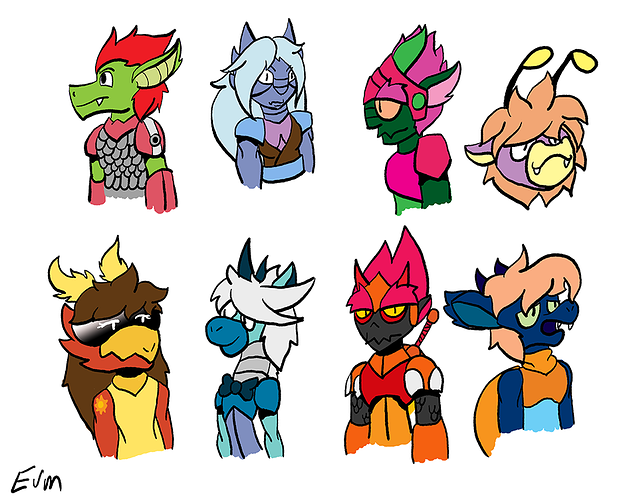 So, I recently did some art style tests for character designs for DRGN and I wonder how it looks. Also, still not quite satisfied with Flare's gauntlets and can't decide on whether he should have two claws or 4-5 claws. Also, I think I'm trying to go for a shading style a bit like the Bionicle Animations if anyone remembers that. It took me a while to decide on Rip having 5 or 4 fingers. I think it's cool to have non human characters with odd numbers of digits. I'd go with the two. It'll match his shoulder pauldrons too. 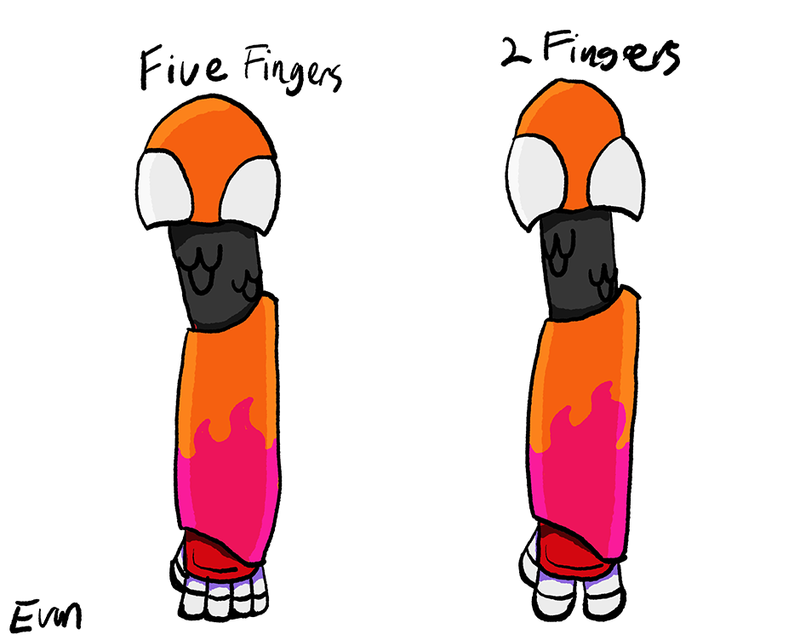 Thanks, I've been leaning towards two fingers (not counting his thumb) as well both because it's more alien, easier to draw, and a bit of a home to Toa Tahu (Who was the main inspiration of Bionicle), who also had two fingers of sorts.